We're reaching out to let you know we've rejoined forces with four-piece RIVAL SONS, who were handpicked by Black Sabbath as the main support act on their worldwide final tour, "The End," kicking off January 20, 2016 in Omaha, NE (full tour itinerary below). RIVAL SONS--Jay Buchanan (vocals), Scott Holiday (guitar), Michael Miley (drums) and Dave Beste (bass)--recently released a 2-Disc Tour Edition of their critically acclaimed 2014 album, Great Western Valkyrie (on October 16, 2015 via Earache Records). After storming onto charts around the world upon its release and being rated the number one album of 2014 by Classic Rock magazine, the new limited edition CD includes a bonus disc featuring six powerful bonus tracks (full track list below). The Long Beach, California rock quartet has supported their four albums with worldwide headlining tours and key support slots. In 2015, they supported Deep Purple and Halestorm on tour. 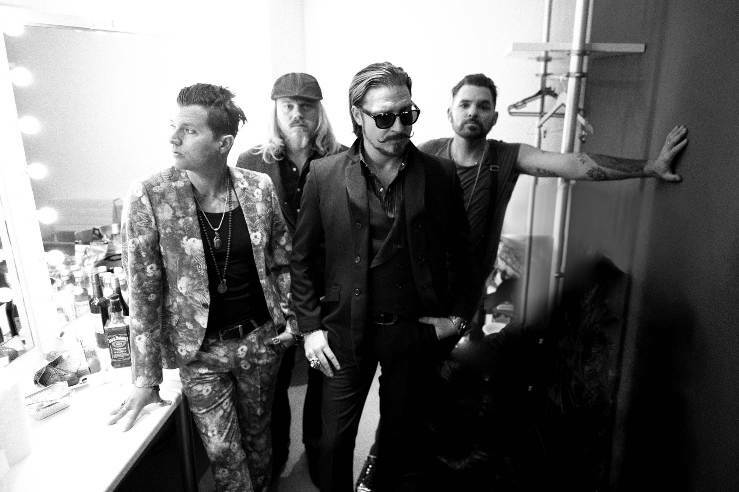 RIVAL SONS have also performed live on Jimmy Kimmel Live, Late Show With David Letterman and LATER...with Jools Holland (BBC flagship music show). Click here to watch the music video for "Electric Man"
Hosted by UK-based Classic Rock magazine, the 10th annual Classic Rock Awards--the Classic Rock Roll Of Honour presented by Orange Amplification--announced today a stellar line-up of live performances from some of the most exciting and respected artists in rock: Kings Of Chaos, California Breed, Rival Sons and Scott Weiland & The Wildabouts. This star-studded list of performers will be joining an already announced list of rock icons to be on-hand at the all-star event on November 4 at the Avalon in Hollywood, CA including: Sammy Hagar (this year's host), Gregg Allman (this year's Living Legend Award recipient) and guitarist Robby Krieger and drummer John Densmore of The Doors (this year's Inspiration Award recipient), and many more. Kings Of Chaos, the part-time, all-star rock'n'roll collective, are one of the most exciting live bands in rock for two distinct reasons: 1. The a-list revolving door of guest performers; and 2. The bands core line-up of Guns N' Roses' Duff McKagan, Matt Sorum and Gilby Clarke alongside guitar aficionado, Extreme's Nuno Bettencourt. It's a combination that brings anticipation and killer live performances in abundance. For this intimate live performance, Kings of Chaos will be joined on stage by Sammy Hagar, the evening's host and frontman of Van Halen, Montrose and Chickenfoot; former Deep Purple and current California Breed frontman Glenn Hughes; and more rock royalty, Def Leppard's Joe Elliott and Phil Collen; and one of the most recognizable and important figures in rock, Billy Gibbons (ZZ Top). Classic Rock editor Si'n Llewellyn says: "Playing live is the lifeblood of rock'n'roll and there are few things as thrilling as watching a rock show. On November 4th we'll be privileged to witness four unique performances from some of the very best in the business." The Classic Rock Roll Of Honour awards will air on AXS TV in December (exact date TBA). Voting for the listener and fan-voted categories just closed and winners will be announced at the awards. For the full list of nominees for this year's listener and fan-voted categories, click here. This really is the ultimate in rock'n'roll awards, and as such will be broadcast in the U.S. on radio exclusively through KMG Networks, a division of Krantz Media Group, it's national programming partner VH1 Radio, producer of On Tap with Nik Carter, VH1 Classic Rock Prep and VH1 Rock Prep, and KMG's advertising sales partner Adlarge Media. In the U.K. it will be broadcast on TeamRock Radio. Check out highlights from past Classic Rock Awards here: http://bit.ly/1qVqXoT. Orange Amplification returns for a fifth year as a major partner in presenting the Classic Rock Roll Of Honour. Joining them are new sponsors MixRadio, official hotel partners the Sunset Marquis Hotel ' Restaurant ' Spa, Universal Music Group and Sammy's Beach Bar Rum. The world's most revered and respected hard rock media brand. Every month Classic Rock magazine goes behind the scenes to bring the real stories of the rock legends from Led Zeppelin to Guns N' Roses, Black Sabbath to Pink Floyd and from those who follow in their footsteps, from Alter Bridge to Rival Sons to the bands you've yet to discover. Written by the world's leading rock experts and featuring rock's most renowned photographers, Classic Rock unearths the reality from the myths. Every issue is packed with exclusive interviews and features on rock's biggest names and tomorrow's superstars, and includes the heftiest and most trustworthy rock reviews section on the planet. Classic Rock: the world's only high-voltage rock'n'roll brand, available in print at all good retailers, on TeamRock.com and the recently relaunched new and improved digital edition available on Apple Newsstand. For more information on Classic Rock magazine visit classicrockmagazine.com. Team Rock Limited (TeamRock) is a new company founded by Billy Anderson and chaired by John Myers. John is the former Chief Executive of GMG Radio, and Billy Anderson was Regional Director of GMG Radio. TeamRock is a new content, creation and distribution business for rock fans around the world. TeamRock content is powered by TeamRock.com, the global home of the biggest and most exclusive stories in rock and metal.Chris Ingham, the Managing Director of TeamRock.com, launched the Classic Rock Awards in 2005 at the Caf' de Paris in London. Chris previously conceived and launched the Golden Gods awards for Metal Hammer magazine in 2003, which has gone on to international recognition. Chris currently oversees the International Development of TeamRock.com and the music brands Classic Rock, Metal Hammer, Prog and The Blues Magazine. For more information on TeamRock visit teamrock.com. Orange Amplification have been a pioneering force in guitar and bass amplification since 1968. They have built a reputation of delivering innovative technology, always built with uncompromising attention to detail and quality. Known as the best British guitar amplifier manufacturer for both design and build, they dominate the world's stages and studios. Orange are rightfully proud of their heritage, a story that began in the late 1960s. The world's greatest rock icons, including Jimmy Page, Stevie Wonder, James Brown, Fleetwood Mac, Oasis, Madonna, Jim Root and Geddy Lee are proud to stand in front of the unmistakable iconic brand and rely upon its unique tone. For more information on Orange Amplification visit orangeamps.com. Universal Music Group (UMG) is the global music leader with strong market positions in recorded music, music publishing and merchandising. Representing some of the most influential and legendary recording artists of the past 100 years, UMG has the most extensive catalogue of music in the industry, including past Classic Rock Roll Of Honour winners Eric Clapton, Def Leppard, Guns N' Roses, Kiss, Lynyrd Skynyrd, Queen, the Rolling Stones, Rush, and The Who. The iconic Sunset Marquis Hotel ' Restaurant ' Spa in West Hollywood, CA, mere steps from the famed Sunset Strip, home to so many legendary musicians and so much musical history, is proud to be supporting the 2014 Classic Rock Awards as this year's host hotel. The Sunset Marquis Hotel ' Restaurant ' Spa is 152 boutique-style suites and villas intertwined within a 3.5 acre oasis of gardens and private retreats, and features alfresco dining at Cavatina, two heated pools, iconic 'BAR 1200' and 'SPA'. For more information on the Sunset Marquis Hotel . Restaurant . Spa, visit: sunsetmarquis.com. MixRadio, the world's most simple personalised music service, is supporting the 2014 Classic Rock Awards. From its catalogue of more than 30 million tracks, MixRadio is curating playlists inspired by each and every category of the awards. With a presence in 31 countries worldwide, MixRadio is also helping to take the awards to a global audience. For more information on MixRadio visit mixrad.io/us/en. An internationally recognised business strategist operating at the intersection of the media, advertising and entertainment industries, Gary Krantz is President and chief executive officer of Krantz Media Group LLC, a leading New York City-based advisory business development and content syndication firm that provides critical direction on issues of content syndication, marketing, advertising, media, entertainment and digital technology. KMG (krantzmediagroup.com) provides strategic marketing and brand development, implementation roadmaps, technology solutions for media, media sales and revenue generation, business development, organisational planning and competitive analysis many for many brands and companies such as Viacom Networks, Clear Channel/Premiere Radio Networks, Studio Center Total Production, My Damn Channel, TuneGenie Networks, and the UK-based TeamRock. In 2012 KMG launched KMG Networks, an independent, multi-platform content and services syndication company. Its services and products include On Tap, presented by VH1 Classic, The VH1 Rock and Classic Rock Radio Network, The Studio Center Network, TeamRock's Classic Rock Roll Of Honour, kand a suite of broadcast products created by respected news broadcaster Lee Harris (mornings on CBS's 1010 WINS). For more information on Krantz Media Group/KMG Networks visit krantzmediagroup.com. AdLarge Media is the fastest-growing independent audio advertising sales company in the US, representing radio, digital and mobile content providers. AdLarge Media stands at the intersection of content, ad technology and advertising, representing both broadcast and digital properties. The company serves a large portfolio of agencies and brands, delivering a demonstrated return on investment in an ever-changing media landscape. Founded in 2010 by industry leaders Gary Schonfeld and Cathy Csukas, AdLarge Media is widely recognised for its collaborative partnerships and customised advertising sales solutions. For more information on AdLarge Media visit adlarge.com. Long Beach, California's RIVAL SONS have confirmed more dates for their recently-announced European tour, due to take place this November and December in support of the band's new album, GREAT WESTERN VALKYRIE. RIVAL SONS fourth studio album, GREAT WESTERN VALKYRIE has charted in 11 major countries around the world. The Long Beach Blues-influenced Rock N Rollers latest release was met with critical acclaim and described as 'densely packed with sheer greatness' by Classic Rock Magazine in their perfect 10/10 review. Earache Records and RIVAL SONS would like to thank the fans around the globe for the fantastic support... proving that Rock N Roll ain't dead! Bassist DAVE BESTE said: "We couldn't be more thrilled about our great position in the charts. It means people are buying and enjoying Great Western Valkyrie and that means the world to us."